A New Moon is a potent time for new beginnings. The Sabian symbol for the current New Moon at 1+ degrees of Taurus is supporting the idea of a powerful start-up: An electrical storm. Furthermore Mars in Virgo is in direct motion again, after its three months long retrograde period, and forming a favourable trine to the New Moon. Mars helps you to get things done. It is the planet which you use to get what you want. So, you would expect that everything works for you really well at the moment. This is not automatically the case. Let’s take a look at the obstructions. Mars is conjunct asteroid Psyche, one of the ten most massive main-belt asteroids. Astrologically Psyche represents a vulnerable spot; a sense of a wound which we mistakenly think cannot be healed. Don’t surrender to feelings of powerlessness coming from Neptune opposite and Pluto trine to the Mars-Psyche conjunction. The wound can be healed, though the recovery may take time. The New Moon is in conjunction with asteroid Tantalus. Tantalus was discovered in 1975 by Charles T. Kowal, who two years later found also Chiron. In mythology Tantalus was a mortal king, who did some bad things against the gods. His eternal punishment in Tartaros was to stand in a water pool beneath a fruit tree. Every time he tried to drink the water, it lowered. Wind blew the branches out his reach whenever he tried to eat. He would always be hungry and thirsty. The word tantalize comes from his name. Asteroid Tantalus indicates times when something that you badly want is just out of your reach. The combination of Mercury and Uranus in Aries refers to originality and speeds up thinking. You are eager to express your views. Yet you may have difficulties in getting your voice heard, as there is asteroid Kassandra conjoining those two. The asteroid is named after a prophetess in the tales of the Trojan War. She had the gift of prophecy, but no one believed her predictions. 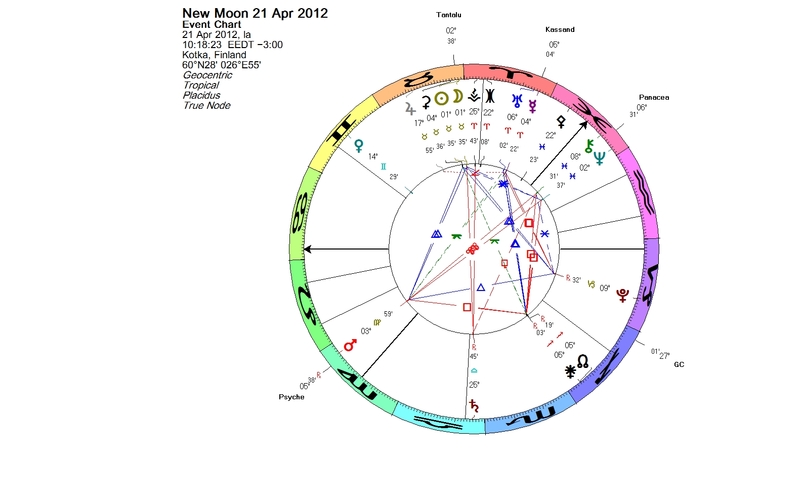 The New Moon in Taurus (the conjunction of the Sun and the Moon), the Mars-Psyche conjunction in Virgo, and Pluto in Capricorn form a grand trine in the earth signs. A grand trine represents patterns that hold, but sometimes are difficult to get out of. The earth signs tend to be cautious. In addition, Saturn has been hanging opposite the Sun like an anchor. This aspect is already receding, but you may still feel some of the weight. The way out of stuck patterns of a grand trine is a planet at the midpoint of two planets, making sextiles to them and opposing a third. This aspect figure is actually called a kite. Asteroid Panacea in Pisces is at the forementioned midpoint, showing a way. Mars at the tail end acts like a power source. Panacea is a healing asteroid. It represents cures for all kinds of problems and difficulties. It symbolizes the philosopher’s stone, the legendary alchemical substance which would enable the transmutation of lead into gold. In the chart, asteroid Panacea suggests what you believe it takes to find solutions. Chiron conjunct Panacea adds awareness and healing, Neptune suggests that you can find solutions in your unconscious. Don’t let frustration take over. Let the kite fly! The April Full Moon is glowing in Libra together with Haumea, one of the largest Kuiper belt objects, and perhaps the strangest one in the whole Solar System. Finding balance is the challenge now. You may need to make tiny adjusting moves just at the right moment, like a tightrope artist dancing on the wire. Philippe Petit, a highwire-walker, who is famous for his walk between the towers of the World Trade Center, was born with his Sun conjunct Haumea. The Full Moon is an opposition of the Sun and the Moon. Libra is a sign ruled by Venus, thus we can say that the Moon in Libra is ruled by Venus. The Sun is in Aries, which is a sign ruled by Mars. Venus and Mars for their part are both in signs ruled by Mercury (Venus in Gemini and Mars in Virgo), so, in a way, Mercury is leading the show. Mercury is moving forward again after the direct station, which occurred shortly before the Full Moon, so we can anticipate mental energy to flow again. However, Mercury is unaspected in the chart, i.e. it is not receiving any major aspects from the planets. This can appear as difficulty to express the mercurial capacity. On the other hand, unaspected Mercury is unrestrained by other planets and can act in exaggerated manner. Haumea is named after the goddess of childbirth and fertility in Hawaiian mythology. The Sabian Symbol for the discovery degree for 13 Libra is Children blowing soap bubbles. The myth reflects physical properties of this icy distant world. Most things out in the Kuiper belt are about equal portions of rock and of ice, but, unusually, Haumea is almost entirely composed of rock. Haumea has two moons, and it is followed in its orbit around the Sun by a swarm of small icy bodies that were ejected from the surface of Haumea, when another object slammed into it in the distant past. Scientists call them the Haumea family. Haumea is the fastest rotating body of its size class, and its shape is therefore stretched out like an American football. To establish astrological meaning for a new planet can be a painfully slow process. There are different methods of doing this. We can study charts of people who have the object in question prominently situated in their birth chart, for instance, in a tight conjunction with their Sun, and observe mutual factors. Sometimes the influence is subtle; in other cases it can be quite tangible. Among the musicians and artists who were born with their Sun conjunct Haumea are Ian Anderson, Mark Knopfler, Amy Winehouse and Pink. Anderson and Knopfler are Leos, Pink and Amy Winehouse are Virgos. The singer-songwriter Pink shares Philippe Petit’s interest in acrobatics. She has performed doing dashing trapeze acts while singing. She is a fearless artist, who does things her own way. Balance is required also when standing on one leg while playing a flute, like Ian Anderson, the leader of the legendary Jethro Tull. He introduced flute to rock music. As a flautist, he is self-taught, and his style is unconventional and recognizable. Another self-taught musician, whose distinctive sound is recognizable, is Mark Knopfler. His fingerpicking technique is not common among electric guitar players. In an interview Knopfler has said: “…if there is a definition of freedom, it would be when you have control over your reality to transform it, to change it, rather than having it imposed upon you. You can’t really ask for more than that.” Perhaps the shape-changing goddess Haumea contributed. Amy Winehouse was unique. It’s been said that she made it easier for unconventional women to have mainstream pop success. A continuing wave of fearless female musicians has emerged in her footsteps – like the offspring of Haumea. One of the biggest news events of 2010 was the rescue of 33 Chilean miners, after they had been trapped underground for more than two months. At the time of the rescue, the Sun was conjunct Haumea. The element of stone is concrete. The theme of rebirth and transformation is obvious. Since the usual access to the mine was collapsed, an alternative “birth canal” had to be drilled for the delivery. In fact, the first miner to ride the rescue capsule to the surface, Florencio Ávalos, has afterwards described the event as a rebirth. Overall, the energy of Haumea feels bold, but not unsound. What was conceived during the New Moon two weeks ago is ready to be burst in the air now. You are currently browsing the Lunations by Kirsti Melto weblog archives for April, 2012.